Usain Bolt just confirmed what various tabloids have been reporting over the last few weeks that he and Kasi Bennett are engaged. The couple is currently vacationing in Bora Bora following a week long of bad press for the sprint legend over some alleged cheating. Following his Rio Olympic triumph, Usain Bolt was spotted partying with several different women in Brazil and in London. One of the ladies even posted a photo of herself in bed with the track star. Seems Kasi Bennett accept not just his explanation but also his hand in marriage. 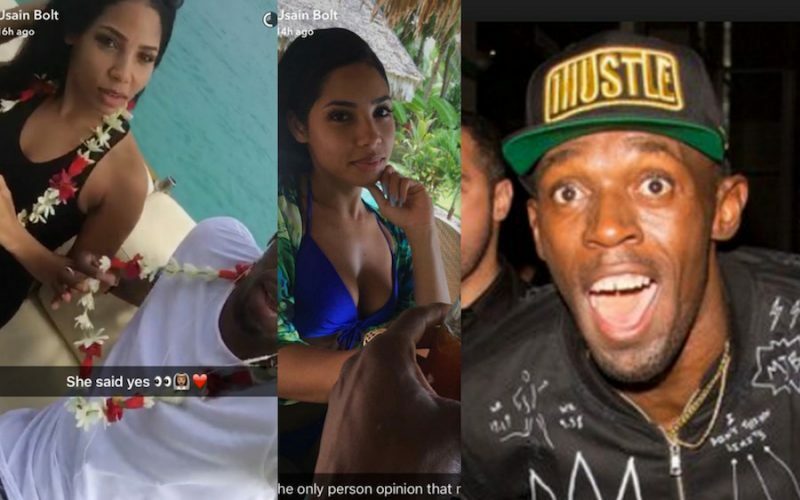 Over the weekend Bolt posted several photos on Snapchat of the two enjoying some much needed alone time. He captioned one of the photos “She said yes” along with a heart emoji. The 20-year-old Brazilian student Jady Duarte told the Daily Mail that she thought that she and Usain Bolt had a real connection after their passionate encounter. She is rumored to be the widow of a Rio drug lord. The Jamaican sprint king was also spotted kissing another female in a nightclub in Brazil. The Brazilian girl got a measley €100 from Usain for selling herself to a multi millionaire. The girls in the London harem were his lawyer and doctor friends from Jamaica who the media have reported as being groupies. Why didn’t they introduce themselves to the photographers and explain who they were instead of ducking and hiding in the car like dirty secrets? Whereas Kasi gets a vacation to tropical Bora Bora with her man. Kasi comes out on top. The rest stay hating her. Big up yourself Kasi. Yeah, i agree but there is still that pic of him kissing that girl though. Well, if his fiancee is okay with it then who are we to judge. I’ll tell you one thing, there will be riots in the streets if he marries Kasi because by the looks of it, my man keep or has kept plenty woman and some of them are not happy at all that one girl is getting quality treatment and vacations in Bora Bora. Kasi, had better watch herself. Check out Kasi’s IG page, there is one woman who sounds well unbalanced. 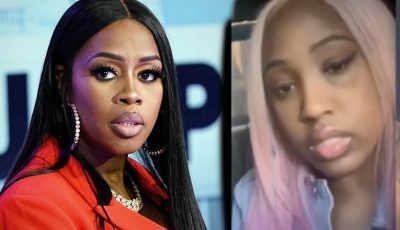 She calls herself Melly something and there are other websites where you can see that spurned lovers are going mad.